Free yourselves from the shackles of processed meat and use your money in a different way. Subway is ending the $5 Footlong deal. Personally, this is fine because I can get processed lunchmeat many places for less than five dollars and the only subs Subway ever had that actually cost five dollars were the least-appetizing sandwiches on the menu. I can honestly say, without a doubt, that the last five times I've had food poisoning, each instance can be traced back to a Subway meatball sub. I'll never learn. If you are one of those people who frequent Subway (seriously, why, unless you work there? Heck, Jimmy John's is better than Subway!) 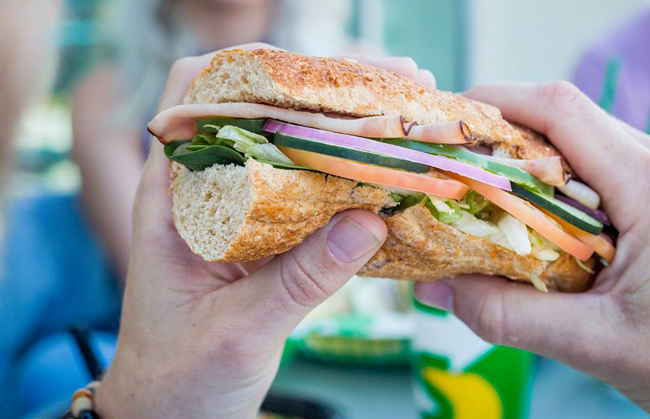 and this is the $5 footlong that broke the camel's back regarding your Subway loyalty, here are some ways to utilize your five dollars that are way better than Subway. I will take good care of it, I promise. Look at you, doing a nice thing with your Subway money. I'm proud of you! Make sure you catch a happy hour deal with this because you need to have something left over in order to tip the bartender. You know those drinks that take the barista FOREVER because they have to massage each individual coffee bean and then froth the thing with, like, alpaca milk before garnishing it with cinnamon and flakes of a rare nut only cultivated by three tribes deep within the Amazon rainforest? Yeah, buy one of those. He will reward your generosity by making you his heir. A guy won the lottery three times! Surely, if one man can be so lucky, you're good for at least one lottery win. You've never been considered "unlucky," so you've got a pretty good shot. It's only five dollars, think how your life would change once you have the untold riches of a lottery winner! Best. Investment. Ever. After a few hours of doing nothing except stare at a five dollar bill, it's only natural that your mind will wander to the point where you will begin having conversations with Honest Abe. With Lincoln's experience of having grown up on a farm, putting himself through law school, serving in the United States Senate, being elected president, leading America (or at least the north) through the Civil War, giving the Gettysburg Address, and issuing the Emancipation Proclamation, he's sure to have some interesting stories! Plus, with his keen political mind, he can probably teach you a lot about getting ahead in the world! When you find the money in that pocket months from now, that will be a pleasant surprise. Treat yourself! If you keep saving your money, eventually you're going to have enough money to buy a footlong sandwich from Subway! How are YOU going to be spending your five dollars? Share your thoughts with us in the comments below.